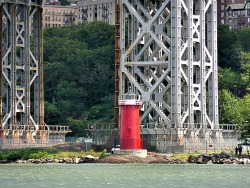 The Little Red Lighthouse may be the most iconic site in Washington Heights, but it's certainly not the only thing to see. Though still overwhelmingly Hispanic, the Heights is becoming more diverse every day as young artists and families move in. There are two attraction-filled parks along the Hudson River: Fort Washington Park and the Fort Tryon Park, both named in honor of their Revolutionary War history and home to the aforementioned lighthouse and the Cloisters, the Metropolitan Museum of Art's uptown branch. Plus there's the historic Morris-Jumel Mansion, which served as headquarters for General George Washington during the Battle of Harlem Heights. While there may not be as many upscale restaurants and businesses in the Heights as in adjacent Inwood, the area is rich with Hispanic culture and boasts one of NYC's best under-the-radar green spaces. Parents keep up on everything going on in the area by joining the Washington Heights Parents Group. Our guide to Washington Heights has the scoop on the best places to eat, play and experience with kids. We hope you enjoy getting to know the neighborhood with your family.